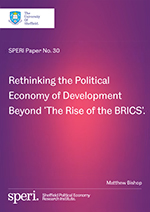 This new SPERI, Paper presented at the 2016 SPERI Conference, revisits the ‘rise of the BRICS’ by challenging the notion itself, which according to the author Matthew Bishop, is a hollow phrase and only describes shifts in the contemporary global political economy. Using this critique as a point of departure, this paper interrogates prevailing ways of thinking about the political economy of development in a rapidly changing global order. ‘The Rise of the BRICS’ is rejected as a useful conceptual device, but is considered nonetheless to embody a number of hidden implications that, once identified, represent important avenues for rethinking development today. These are: firstly, that development should be viewed as fundamentally a transformative process; secondly, that to both understand and engender it requires a better appreciation of the role of the state and its relationship with the market; and, thirdly, that there are deep-seated exclusionary dynamics in contemporary development patterns in which stark and often quite puzzling patterns of inequality can be discerned, which need to be taken seriously. Matthew Bishop concludes by considering the wider consequences of these insights and elaborates the broad contours of a post-crisis research agenda for pursuing the study of development that seeks to combine the analytical sophistication of (international) political economy with the ‘old’ moral agenda of development studies.